One of the featured artists. Read the article here. I had 2 of my paintings selected to be a part of the “Feast Your Eyes” Exhibit, Celebrating the foods of the south through art. My Peach Harvest” painting was also used for the banners to promote the show. Stop by The Red Wolf Gallery in Brevard, NC to see more of my work. 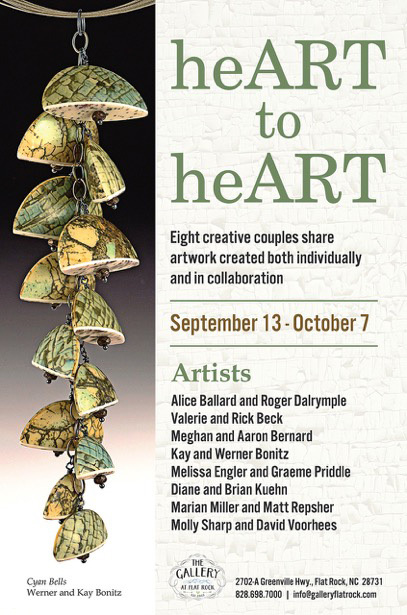 We were part of this fun exhibit at the Flat Rock Gallery. It’s the first time Diane and I ever collaborated on a piece that we named “Gypsy Girl”. It’s a combination of pastel and textile art.